Bio: Allan Berman was born in San Francisco in 1942 and through the years has become well known for his realistic trompe L'oeil portraits, still life, and wildlife paintings. Allan studied under the late modern day master, Roberto Lupetti, enabling him to ally his style of realistic portrayal with classical technique. 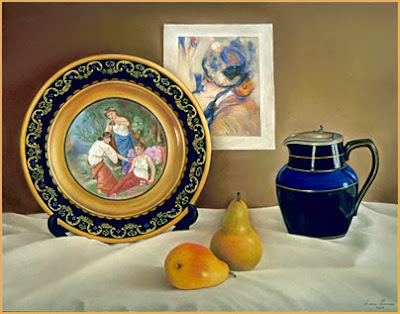 Allan has gained national and international recognition as one of America's premier pastel artists. From 1976 to 1080 he was Resident Still Life Artist at the New Masters Gallery, Carmel, California. He started to garner awards in 1998; among his portrait commissions are those of Sylvester Stallone and Buddy Holly. (Allan is a keen musician, and Elvis tribute artist, performing for President Clintons 50th birthday celebration live on television.) Allan is also a formidable photographer, his ability displayed by his stunning images of Lake Tahoe and Yosemite. He is a past member of the Sierra Pastel Society and has featured in numerous publications – I recently came upon this artist in an old copy of Pastel Artist International, issue 6, 2001. Allan’s studios are in Palm Desert, Ca. Navigation: This minimalistic website is easy to navigate. The website is copyright up to 2010 so I don’t know if it is being actively maintained. No awards are mentioned later than 2003. Image View: Thumbnails open in a viewer; you may scroll through. Download is possible, although the file size is small. Les Mademoiselles Classiques dates from 2000. It is 14 x 18 ins, 404x317, 371 KB. Bio: Jeanne Rosier Smith studied art at Georgetown University, at the New Jersey Center for Visual Art and the DuCret School of Art in New Jersey. After earning her Ph.D. and spending ten years teaching college English, she began painting professionally when her youngest child started school ten years ago. Jeanne Smith is a signature member of the Pastel Society of America, the Connecticut Pastel Society and the Pastel Painters Society of Cape Cod, and a juried artist member of the Copley Society, the Salmagundi Club and Academic Artists. 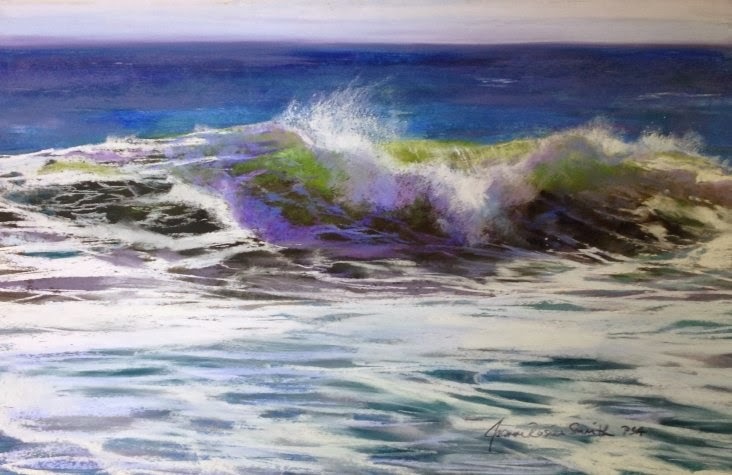 She has exhibited at the Massachusetts State House, the Boston Artists Guild, and nationally at the Pastel Society of America, the Catherine Lorillard Wolfe Arts Club and American Artist Professional League shows, among others. She has won numerous awards, including a landscape prize in the 2013 Pastel 100; the IAPS Prix de Pastel in 2012; the Grand Prize in International Artist Magazine's 2012 Rivers, Lakes, and Seascapes Competition; and the Art Spirit Foundation Gold Medal Award for Excellence in Pastel at the 2011 American Artists Professional League Show. Her work was featured in the October 2012 International Artist Magazine. She is represented by Sosebee Gallery on Nantucket, Powers Gallery in Acton MA, Gallery 31 in Orleans on Cape Cod, and Francesca Anderson Fine Art in Lexington MA. Her paintings are in collections across the US and in France, Monaco and New Zealand. Jeanne offers weekly classes and weekend workshops at her Sudbury, Mass studio and is in demand for classes and demonstrations nationally. Subjects: Landscape, especially the sea; still life; portraits. Navigation: This website is easy to navigate; galleries are well laid out and clear. Gallery: Multiple galleries of Landscape; Seascapes; Still Life. Also Portrait, and New Work. Image View: Galleries consist of thumbnails that may be enlarged, or viewed in a slideshow. Pictures cannot be downloaded, and the Prt Sc option is discouraged by the use of a large copyright watermark.